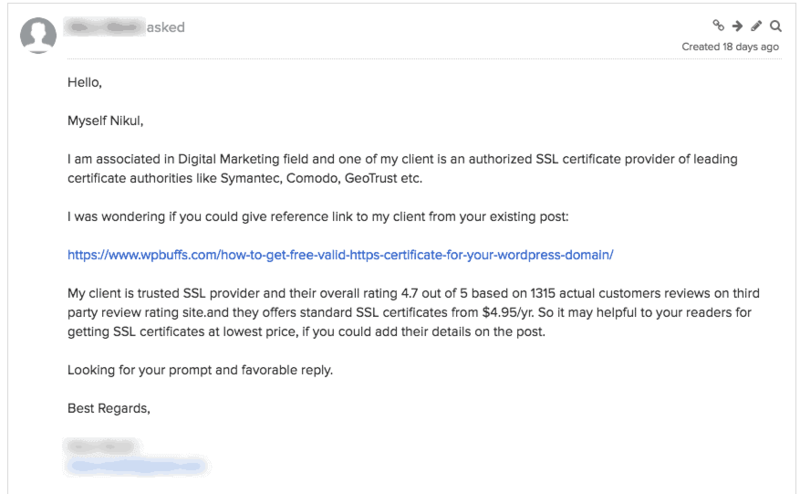 As a regular contributor to several blogs, and the webmaster of my own (this one, UrbanCheapAss.com, and Tanks that Get Around), I get requests from people trying to build backlinks at least once per day. Sometimes these requests are compelling, and I grant them, and sometimes they’re so misguided that they go straight to the trash, without a reply. 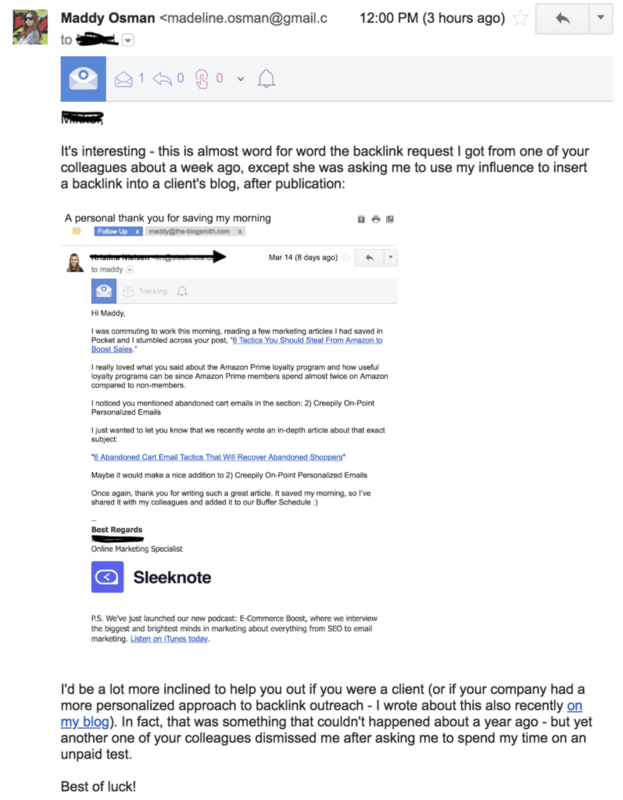 For selfish reasons, and to improve the process revolved around how to get backlinks, I’ve analyzed some of the most stand-out backlink requests I’ve ever gotten (both good and awful), with some practical takeaways so you have a better idea of how to get backlinks for your own efforts. Answer the Question: What’s in it for Me? This pitch actually pointed to a specific article and demonstrated an understanding of the type of content that can be found on my website. It amazes me how many backlink requests I get that aim for a general approach, throwing up the link for an article they want a link to, but giving no direction as to where the link should specifically go. So one lesson that can be learned from what this pitch did well is to fill in the blanks. Don’t make me think. If you want me to do something for you, make it as easy and intuitive as possible – down to what specific part of the article your link should be attached to. But my main issue with this backlink outreach attempt is that it’s completely self-serving. In my years of sales, I learned how to always approach a customer with what I was selling as the solution to their problems. But this person made no such attempt to win me over. Nothing about this email makes me want to stop what I’m doing, log into WordPress, open up the post in question, and add in a link. It might seem like a small investment of time on my end, but I really don’t appreciate interruptions during my busy work days unless there is a good reason for them. 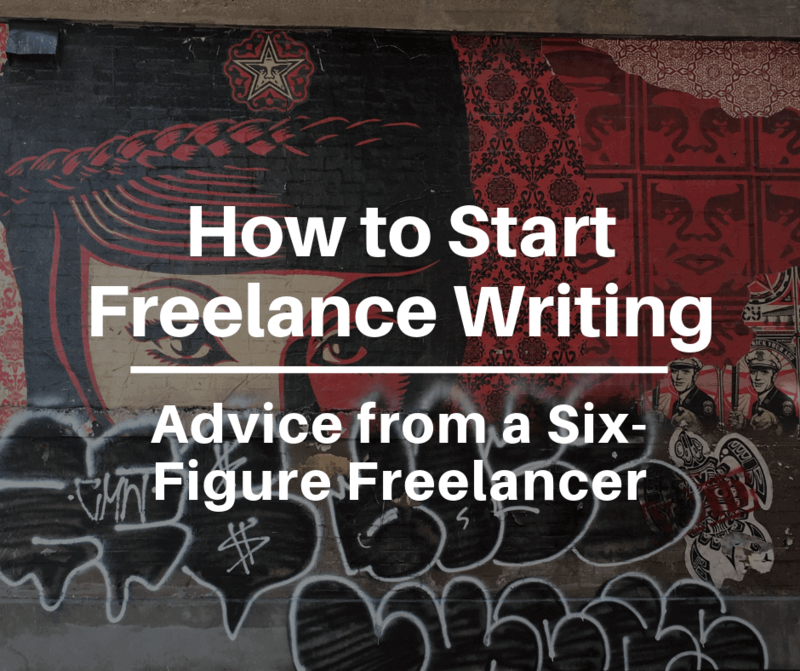 Not only did it reiterate my post’s title and URL, it also drew attention to certain elements within the post – showing that they had at least read that part of it. They explained how and where they could fit on this list, in a non-spammy way. They offered to not only write the text for me but to also help me promote my post across their social channels. (For whoever reads this in the future and asks for a backlink on my website, you’ll get a lot further if you’ve already shared the content in question on your social channels—not as a “reward” for my compliance). Needless to say, they got what they wanted – a fancy backlink on my little corner of the internet. We just can’t ignore the fact that the same person from above (the bad example) emailed me AGAIN as if they had never emailed me in the first place. Another annoying revelation: I’m apparently on their email list now (see the unsubscribe link on the bottom). In my opinion, it’s also a bit tacky to ask if I have an interest in long-term collaboration (whatever that means), before we’ve even connected on the first step! Because this honestly happens to me ALL THE DAMN TIME, I’ve got a fun little bonus for you along the same lines. I was a little bitter about the unpaid work they had asked me to do prior as part of a totally seperate conversation that ended up being a total waste of time. Is this karma? I’d like to think so. I’ve written for Content Academy, but once a post is published, it’s more or less in the editor’s hands. This goes for basically anywhere I contribute. Unless you have an incredibly compelling reason for me to go up the chain of command and create more work for all parties, there’s just no way. This person linked to a category, which is not a post. This issue makes me doubt the legitimacy of the next sentence, which claims that she then shared the post and received positive responses. If you really did get positive responses, and took the time to share my post, wait for responses, then email me – I want proof. But a simpler method for how to get backlinks would be to just not stretch the truth. The main takeaway here? Don’t blatantly lie to me, especially if you want me to do something for you. Or, don’t make claims you can’t (and don’t) back up. I actually didn’t notice the post vs category issue on my first read of this email, and indulged the sender. I wasn’t willing to get back in contact with Content Academy for a small link update, but the organization this person represented seemed like a potentially good interviewee for another client’s blog. At this point, we’re probably two weeks into this email exchange. Though I didn’t comply with her initial request, I did go out of my way to create a new mutually beneficial opportunity. Instead of trying to make it work, she created additional and unnecessary work for me. I sent her one more email, basically putting my previous points in numbered question form. 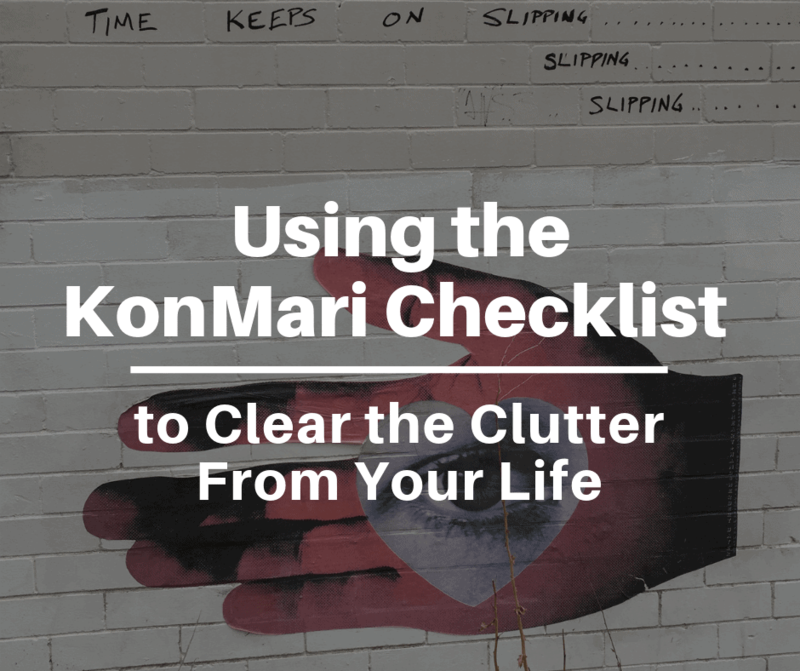 She continues sending me emails detailing who she’s passing these on to, without ever coming back at me with the one thing I really need – answers. Why did she even bother reaching out in the first place? I feel like the main issue with people who ask for backlinks is that they put in the bare minimum effort to satisfy whatever higher powers are forcing them to do it. This lack of effort starts with the initial email, which might be addressed to “To Whom it May Concern,” or “Hey,” instead of the person whose name is plastered all over the website in question. It continues with an inability for them to target a specific post, and a specific part of that post, where one of their specific articles would be the perfect fit. It ends with inadequate or uninformed follow-up, like when I make an effort to figure something out and find a way to benefit us both, but the issue never gets fully resolved. It sucked because I could tell immediately that it was an email that had been copied, pasted and sent to a ton of other website owners just like me. All they did was add the link to my post! It doesn’t feel good to be labelled as “just another website” when we’re all trying so hard to be more than that. There was no effort to build rapport or bring any value to my readers. I want to cultivate relationships with people in the WordPress space and build links that way, not receive a template email to 1000 different bloggers by somebody rolling the dice. In closing, if your entire email is copy / pasted, consider it deleted. 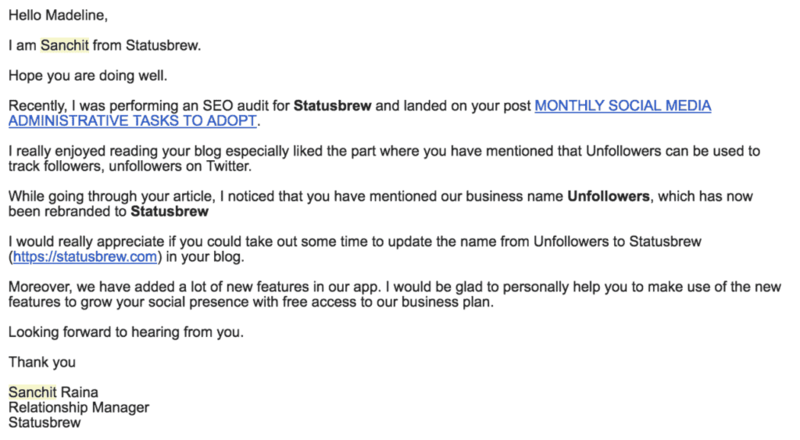 That, my friends, is how to get backlinks – without being annoying. HARO is short for “Help a Reporter Out.” Powered by Cision, this tool allows journalists to submit requests for sources and expert inputs on the articles they’re writing, organized by broad categories. HARO sends emails three times a day, every day, that are loaded with opportunities to pitch your expert advice – and get a backlink.  I’ve already generated a lot of backlinks/press for The Blogsmith by taking the time to answer at least one query each day. 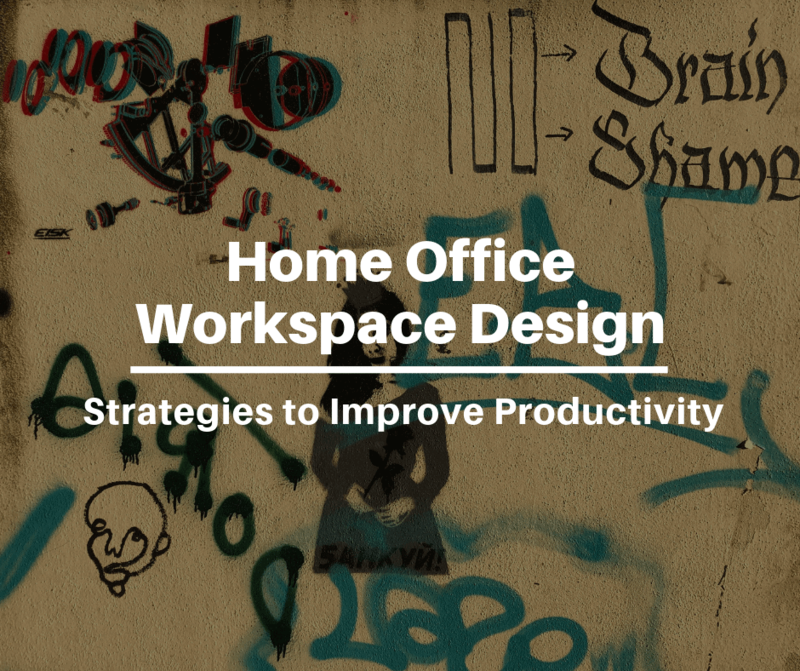 Looking through HARO’s three times daily emails and responding to queries can certainly be time-consuming. 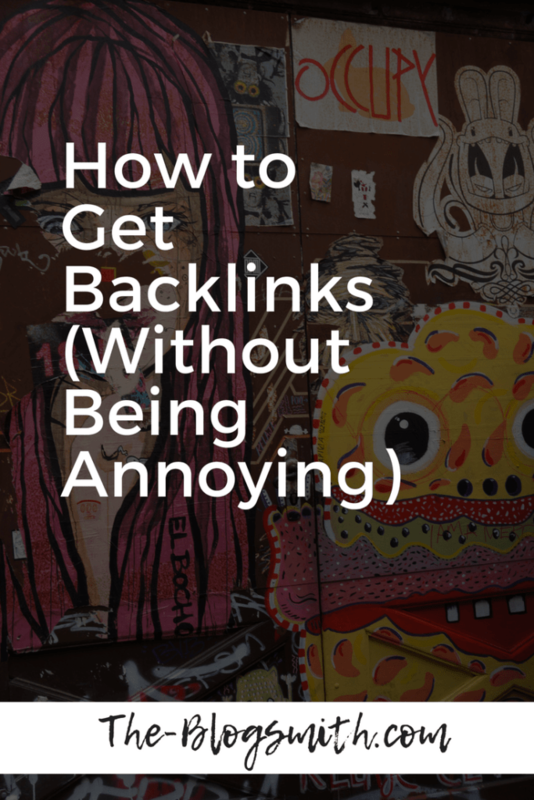 But if you make it your goal to respond to just one query each day, you’ll have a lot more success with how to get backlinks than sending a high quantity of cold-pitching backlink requests. 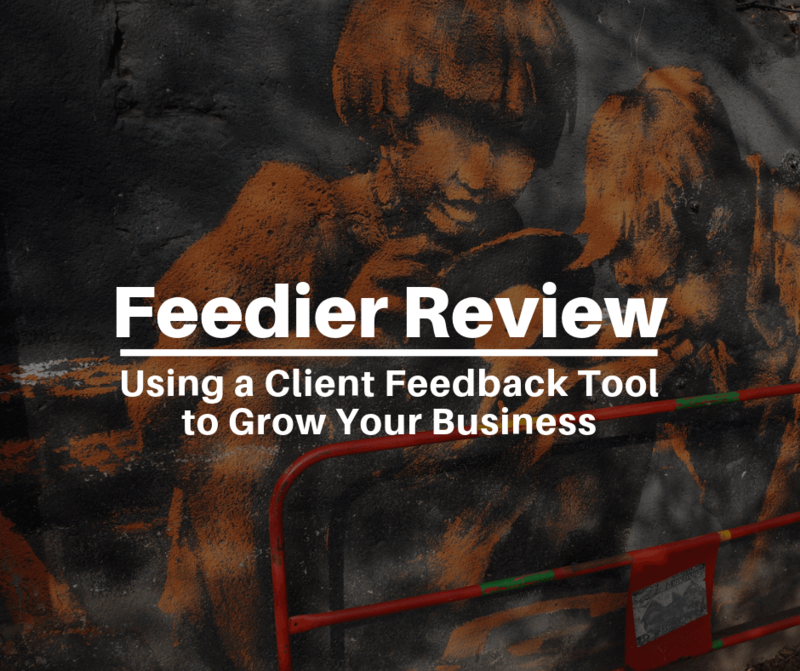 They key here is to make sure that your responses are actually useful – don’t waste your time if you can’t spare at least 100 words of useful insights. 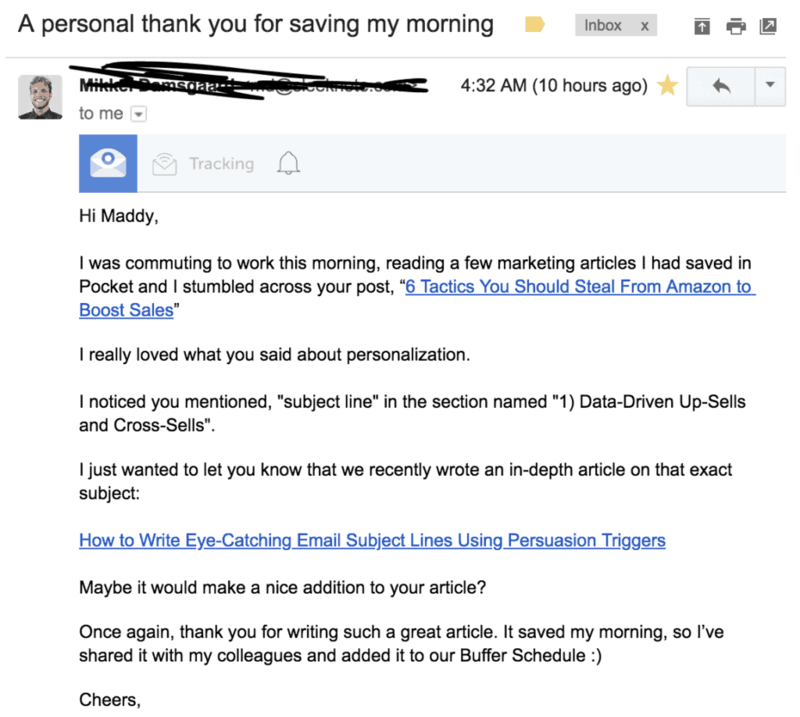 If you do opt for the cold email route, just like with sales emails, influencer outreach, or pitching yourself to editors, you’ll want to create a template for your backlink outreach efforts. The important thing is to customize several areas of this template for each recipient so that it doesn’t come off as a form letter. I recently came across your article, [TITLE], and loved it. It’s a great resource for [AUDIENCE] about [TOPIC], which also made it a great fit for [COMPANY’S] social channels. I’ve shared it on [COMPANY’S] [Twitter?] and [Facebook?] accounts (fill in the blank with your networks, and link to the post if you actually shared it. Don’t lie.). We’ve put a lot of time and effort into making this the best resource on [TOPIC], and would appreciate any help you’re willing to give! Please let me know if there’s anything that [COMPANY] can help you with. Keep in mind that each situation is different and that you should adjust this template for how to get backlinks according to your company, audience, and goals. At the very least, it will provide you with a good foundation to start, ensuring that you accomplish some of the most important objectives with your backlink outreach efforts. 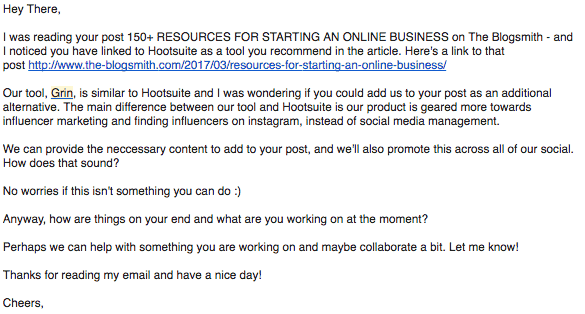 And if you want additional options, Hubspot shares 9 link building email templates for how to get backlinks on their blog. 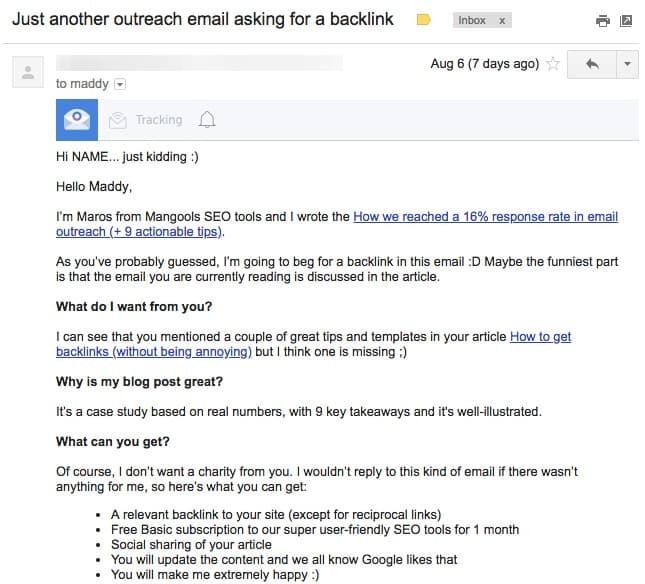 If you’re looking for even more resources to help your backlink building efforts, check out how Mangools achieved a 16% response rate with their backlink building efforts—and some actionable takeaways. You’ve heard a lot from me on the topic of how to get backlinks, but I’d love to hear from you. Are you getting or giving backlink requests? What is working and what’s falling flat? 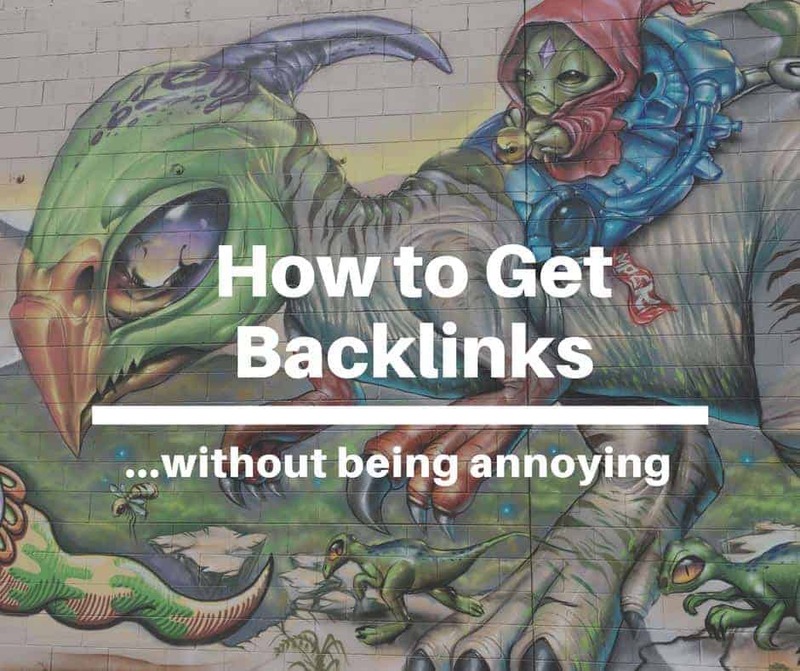 Share your thoughts for how to get backlinks (without being annoying) in the comments below! 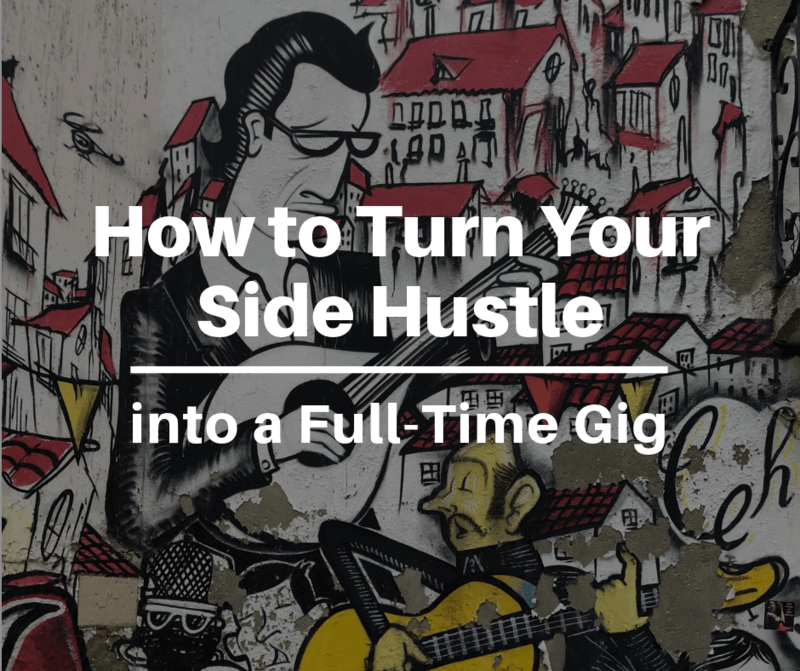 Hey Maddy, great article…I’ve been researching how best to approach bloggers to get featured and this has given me a good understanding about what it’s like on the other side of the coin. I’ve also had similar spammy messages before and it’s a very annoying intrusion when you’re beavering away with something. Thanks for a good read! Appreciate you trying to see things from the opposite perspective! I think that attitude will lead you to a lot of success when trying to get backlinks 🙂 Thanks for stopping by and sharing your thoughts!